As mentioned earlier, the only building surviving from the village is the church. It is surrounded by a small graveyard and there is a war memorial beside the path as you approach the entrance. On the opposite side of Church Road a rectangular building known as Jetset House holds a training centre for flight and cabin crew run by TUI Travel. 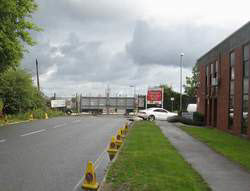 As you walk back towards the crossroads you will pass a warehouse, the forecourt of Gatwick Car Sales, and a Travelodge hotel. Turn right up the former A23 and after a hundred metres or so your path will be blocked by the fence around Gatwick airport. 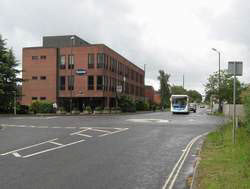 If you then turn round to face the crossroads you will see the offices occupied by the head office of the construction company Farnrise. The building stands where Mason's recreation ground used to be. During the 1970s the land, about an acre, became overgrown, but in 1981 planning permission was granted to change its use. It was sold for £490,000. The money was used to establish the Thomas Alexander Mason Trust. During my visit to Lowfield Heath in July 2011 I had the pleasure of meeting Tony Tester. When he was growing up Tony lived south of the village, at County Oak, but he attended Lowfield Heath school for a year just after the Second World War, and returned to the village for various purposes as a teenager and young man. Miss Ryde, mentioned earlier, was still the head teacher when Tony went to the school. After lunch she would often have to take a break. She would lie flat on a large teacher's desk in one room, while her assistant Ivy Walder took over the class with the request “Don't make a noise, Miss Ryde is having a rest next door”. After we entered the church Tony told me how he and his friend Bill Izzard, aged about 15, went in there one Sunday morning just after the service had started. They were keen to climb the tower, but on coming back down they were stopped by the curate who was playing the organ in the gallery over the church entrance. The curate insisted that they should stay and listen to the next three hymns before they were allowed to leave. After that Tony got on to talking about the dances held in the village, especially the old time sessions on a Monday evening. His regular dancing partner was June Marshall, but he also got to know the two older Dudman sisters well. There is a lot of scope for further research into Lowfield Heath. Please get in touch with me if you might be interested in doing some. 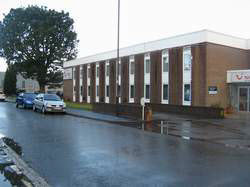 The head office of Farnrise, on the former Mason’s recreation ground.